Summary: You can't help but feel a little cheated. Marketed as a science fiction mystery, Franklyn’s posters all over the London tube give the impression you will witness a Blade Runner-esque neo-noir brimming with deception and treachery. 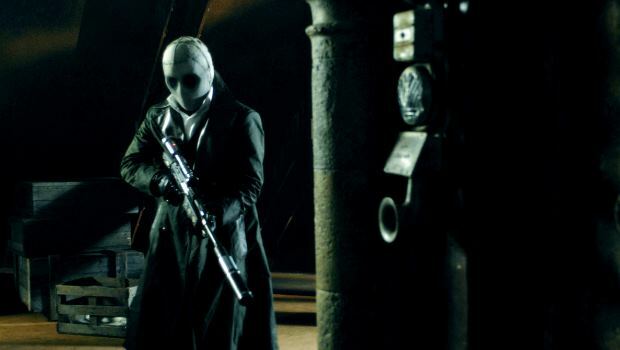 Ryan Phillippe stands wearing a white mask providing a constant blank expression and is flanked by Sam Riley and Eva Green looking dark and foreboding. This mouth-watering prospect soon disappears in the cinema as Franklyn turns out to be a more basic psychological drama set largely in present day London. Gerald McMorrow makes his feature debut with Franklyn, coming from a background of commercials and music videos. It’s been in the works for around six years going from an idea in his head to the finished article, and the most interesting aspect is the futuristic Meanwhile City, a place where religions have sprung up out of trivial scriptures such as washing machine manuals. There the masked Preest (Phillippe) lives, on a mission to eliminate a man he calls The Individual for bringing disorder to the world. Wandering an advanced Victorian setting, he chats to his informant Snakes for the location of The Individual but is captured by the authorities. When he breaks out from prison, his quest intensifies as he becomes ever more certain The Individual must die to return the city’s order. These scenes show the ability of McMorrow to get the most from a small budget as Meanwhile City is an absorbing expanse that is well realised: the writer/director has clearly thought this element of the movie through carefully. Yet, when he switches the action to London now, he looses his meticulous attention to detail and the story unwinds. His three key London characters are heartbroken man Milo (Riley) pining for his first love, struggling conceptual artist Emilia (Green) who is at odds with her mother over her suicidal tendencies she is trying to turn into an art project and Esser (Hill), a fearful father searching for his son. They each go about their respective goals morosely and in vague terms as McMorrow touches on psychological trauma, grief, anger and hatred. As minor characters begin to cross over between Meanwhile City and London, it quickly becomes apparent that the two are somehow linked, however that link is perhaps the Achilles heel he faced in the filmmaking process as you never feel he is sure of how to balance the two as he blends them into one. Meanwhile City is the pin-up of Franklyn’s scenes, it acts as an exciting entry point with which to blur real world problems until they are revealed in the final act of the film, yet it also gives a false impression that Franklyn is instilled in the neo-noir genre. The act of McMorrow pulling the futuristic rug from under our feet as he focuses on London living is less a method of satisfying our curiosity fuelled by pondering on how Preest is connected with Emilia, Milo and Esser – it is more of a trick to get you to watch in the first place, and even more so in the hands of the marketing strategy. You can’t help but feel a little cheated. When McMorrow does come to couple the realities of the two worlds, much of the interest is already lost due to the desperation of the four lost souls to find their way and an increasingly obvious series of twists. He clearly has the motivation to tell intricate, spiritual stories and could be a great asset to the British film industry, however he must seek to find a logical way to deliver them to audiences if he is to continue to write his own scripts.